I was just six years old when I witnessed my first vision of a noble mission. My younger brother fell very ill one snowy night in 1953. I recall gazing out the window at 4 a.m. to see the headlights of an old Plymouth pierce through the thick blizzard, driven by an S&S pharmacist braving the snow to deliver the necessary antibiotics. It impressed me. Following three years of undergraduate study at Kansas State University, I enrolled in pharmacy school and, on June 1, 1968, began my career at S&S Drug as a pharmacy student. I became a licensed pharmacist in 1971. 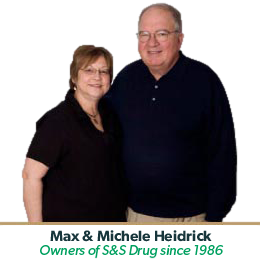 Decades later, now as the owner, I still strive to ensure that S&S Drug meets the needs of our community and its citizens whenever and wherever they needs us; 24-hours a day, 7-days a week. S&S Drug and S&S Home Health have become an integral part of the communities we serve, which would not have been possible without our caring and expertly trained staff, many of whom have committed more than 25 years of service here. While S&S Drug no longer delivers medications in an old Plymouth, we are fortunate to be part of a business that delivers medical supplies and equipment with care and compassion to an extended family that spans all of North Central Kansas.